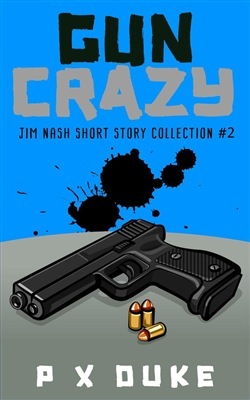 Following in the footsteps of Gun Crazy, this edition is a collection of Jim Nash Adventure stories. Lost Paradise #4 - Jim and Allie end up investigating a double homicide while vacationing on an island resort paradise owned by a venture capitalist Jim once cleared of a murder charge. No Angels #5 - Jim is tasked by an old friend for assistance in cleaning up part of a gunrunning operation created by government mismanagement. He dives full throttle into Mexican waters, only to encounter the mysterious yacht Captain and crew that will transport him to his rendezvous with trouble and death. Mexico Gamble #6 - A beautiful woman. A knife-throwing sister. An unpaid debt. Jim Nash is long on memory and short on forgiveness in this Mexican adventure featuring boats, women, good times, and bad fortune for at least one of his girlfriend Allie’s former employees. No Picnic #7 - Jim is back in Mexico to come to the aid of a former flame that just happens to be handy with a knife. This time, he’s starting out with a boatload of trouble already on board. Two women who won’t allow him to say no to their demands insist on coming along for the ride. It’s a foregone conclusion that this trip will definitely not be going well for Jim. Acquista Gun Crazy 2 in Epub: dopo aver letto l’ebook Gun Crazy 2 di P X Duke ti invitiamo a lasciarci una Recensione qui sotto: sarà utile agli utenti che non abbiano ancora letto questo libro e che vogliano avere delle opinioni altrui. L’opinione su di un libro è molto soggettiva e per questo leggere eventuali recensioni negative non ci dovrà frenare dall’acquisto, anzi dovrà spingerci ad acquistare il libro in fretta per poter dire la nostra ed eventualmente smentire quanto commentato da altri, contribuendo ad arricchire più possibile i commenti e dare sempre più spunti di confronto al pubblico online.